In the front downstairs room of the house, which was to become our dining room, there was was an electric storage heater. This was powered with a low tarif supply but as far as we were concerned it was ugly and inefficient, being placed on the wall between us and the neighbour. 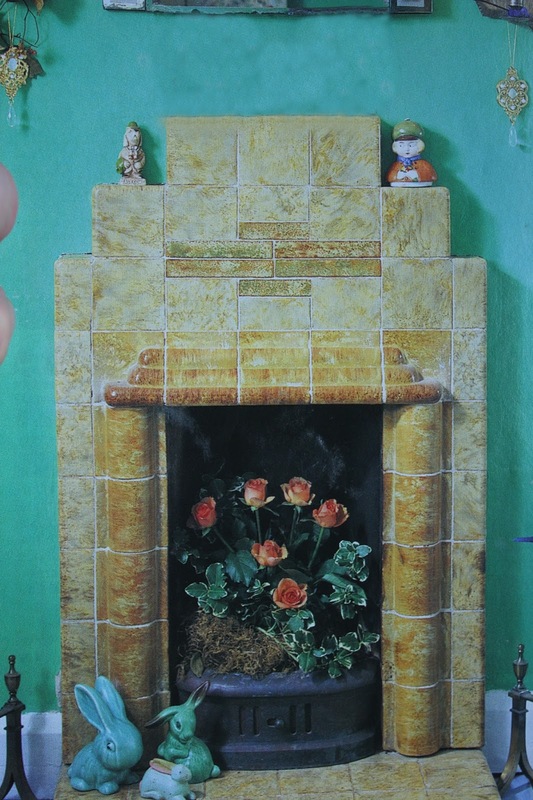 We had already decided to remove the sixties era fireplace in this room and replace it with a cast iron Art Nouveau one we had bought from a builder and open up the chimney. At the same time the storage heater would be moved upstairs to a spacious front bedroom, with fine views of Warwick castle’s firework displays, great acoustics for its concerts and which we intended to use as a sitting room. 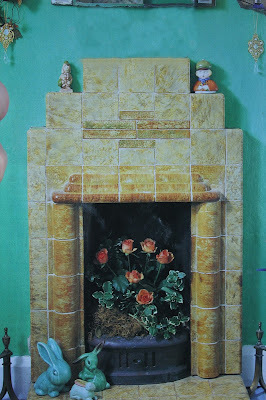 Its function would be to supplement the superb original 30's Art Deco bedroom fireplace. To do this, the heater was isolated from the power supply and dismantled. If you’ve never seen what's inside one of these heaters then you ain’t missing much. Basically, they comprise an electrical resistance, running between heavy bricks. The heat output being regulated by a moveable flap to control the warmed air leaving the unit. The inside rear wall is covered with a pad of insulation. A word of caution: Asbestos was often used as the insulating material in storage heaters and although you will see on many professional websites, dates of 1970 and 1980 quoted as marking the end of its use, you really need to find out exactly if the model you have contains Asbestos before you start taking it apart. Be warned that further to the obvious dangers of Asbestos, this form of insulation, when old can become powdery and thus ever more hazardous to the lungs. It is also of tantamount importance to ascertain if and when Asbestos was banned for use in household appliances/building materials in your particular country of residence. 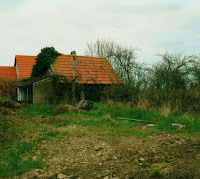 For example, when we moved to our present ruin, here in France, we found that the roofing material on an old abandoned rabbit hutch, attached to a Bread Oven in the garden, contained Asbestos but thankfully, there were disposal procedures in place, which we could follow to rid ourselves of it. 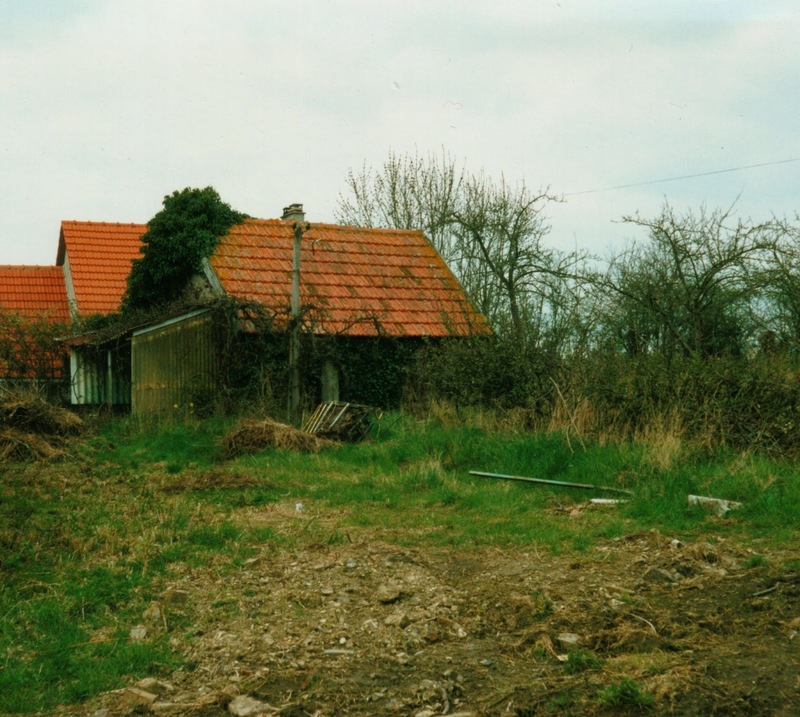 Far left showing rabbit hutches roof cover, thus prior to Asbestos removal and right a couple of years later on. The key point of our old storage heater’s relocation was that it was to be placed against the internal brick wall of the upstairs room which incidentally led directly onto the stair well. Over a period of days after reconnecting the heater in its new room, we began to notice that this wall had started to store heat as well, such that as one ascended the stairs from the entrance hall, one could feel that there was a significant amount of heat emitted. So although we had known that locating it on an inner wall made sense, we got a much greater benefit from the heater than we’d originally expected. This was a valuable lesson to us of how useful it was to be able to store heat. The means of supply (electricity) was certainly not ideal but the way in which a house could benefit from the simple method of charging up a mass with heat and letting convection do its stuff, was. It took about four or five days for the strawcrete to start to feel firm, I was still able to dig into the surface with my fingernail and the surface still felt damp. Nevertheless, I decided to remove the shuttering from around the pad so as to expose more faces to the drier air in the kitchen. I also decided to turn the pad upside down exposing the smooth bottom face to the air and I laid the pad onto an old wire shelf from an oven so that air could circulate freely around it. After a further seven days, the strawcrete felt firm and resisted my finger nail, it also felt considerably lighter. 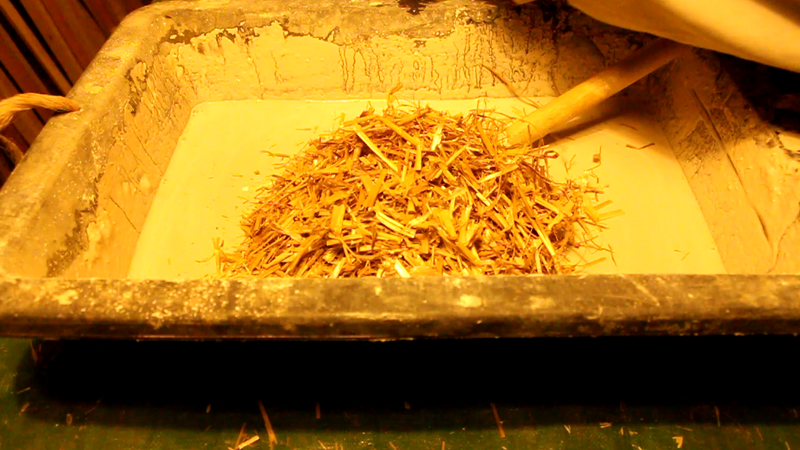 If you compare the colour with the little pure lime sample you are immediately struck by the warm golden colour the straw has imparted to the lime, something we exploited when we used strawcrete as the foundation layer for our hemp and lime insulated walls in our kitchen. Work could then progress on making the wall. The first thing I did was move the stove off its plinth and sweep the chimney, I’ll describe this exercise in another post. Next I put the strawcrete into position on the tiled surface, the smooth, flat side down. I had decided to fit shuttering on three sides of the plinth to act as a guide for laying the stones and to prevent excess mortar from the joints from dropping into the gap between the rear wall of the heatsink and the lounge wall. I used chipboard sheets recuperated from pallets for this. The rear wall was a coated sheet but the side walls were bare of any such coating and thus I covered these with a layer of polythene so as not to draw moisture from the mortar. Across the front elevation I screwed two narrow strips of pallet wood so as to allow me access for laying the stones. 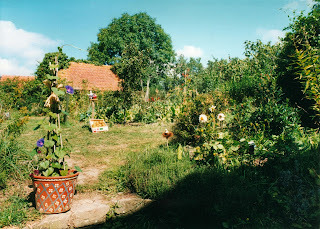 We have plenty of stones in the garden, some are from the house where we have removed parts of walls for windows and doors and some have been dug up over the years of our gardening. I needed stones that had ‘flat’ faces and were fairly regular in shape. The selected stones were cleaned of any soil or clay using a scrubbing brush and water. 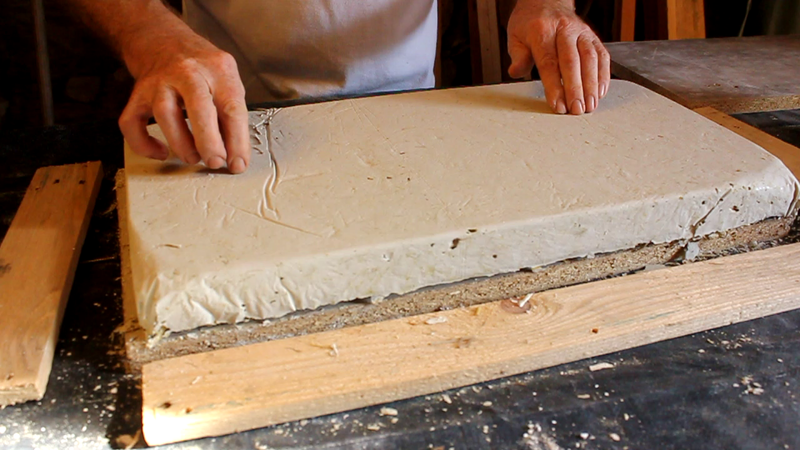 Prior to laying the stones in mortar, I first tried various selected ones, altering their orientation until I felt I had achieved the best fit, then removing them and laying them to one side in the same configuration. I’d decided that any large gaps between the stones would be filled with mortar and small stones. The other point in the construction was to lay longer stones front to back so as to conduct heat into the body of the wall, thus certain ones were selected to go onto the next layer. This also would make a strong bond within the wall i.e. there would be little or no mortar seam running continuously vertically down the wall. The mixing of the lime mortar and the laying of the stones and testing of the new storage heater will be dealt with in a separate blog. Left - another great find for our old house, this time at a yard sale, it replaced a sadly defunct Rayburn anthracite heater with a burnt-out back boiler. 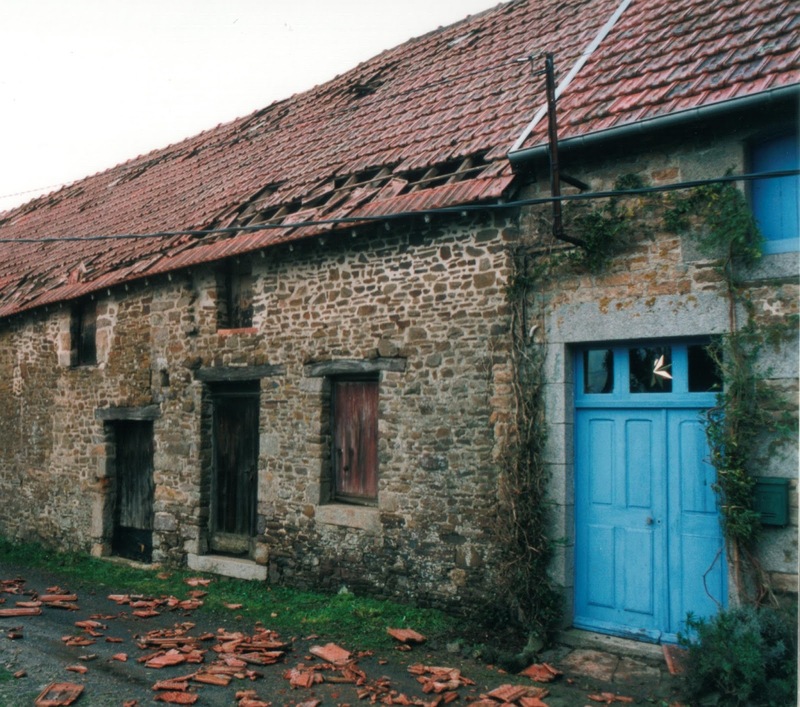 Our house, a vernacular longère was never meant to have glass windows and as it had rarely been lived in during the hundred years before we bought it, that aspect had hardly changed. When we came to think about glazing, we decided use the vast amount of discarded windows available. 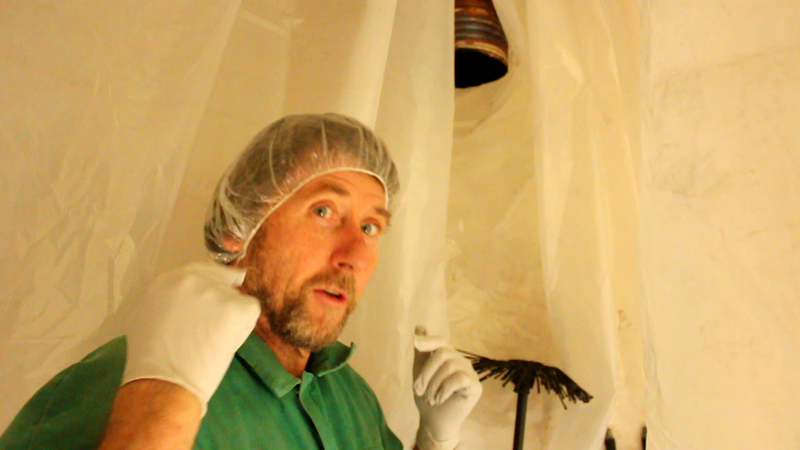 Luckily there was so much raw material, we found a near match for just about every opening. Below is the raw state of our sitting room (middle of photograph), just a few years after the sheep vacated it. As if to add insult to injury and coincidentally a few months before we came out to start living in our house permanently and begin the renovations, hurricane Lothar hit. Nowadays, we tend to forget and thus to appreciate the value of glass windows, which is probably why people are so ready to replace perfectly good ones and dump them. In past centuries, even the nobility could afford only one set of such precious materials and would ferry them between homes as they moved from Town to Country and back again. The farm where Sue was born had one big picture window bricked up to a tiny 'porthole', due to Window Tax, a stark reminder that even daylight can be subject to payment. 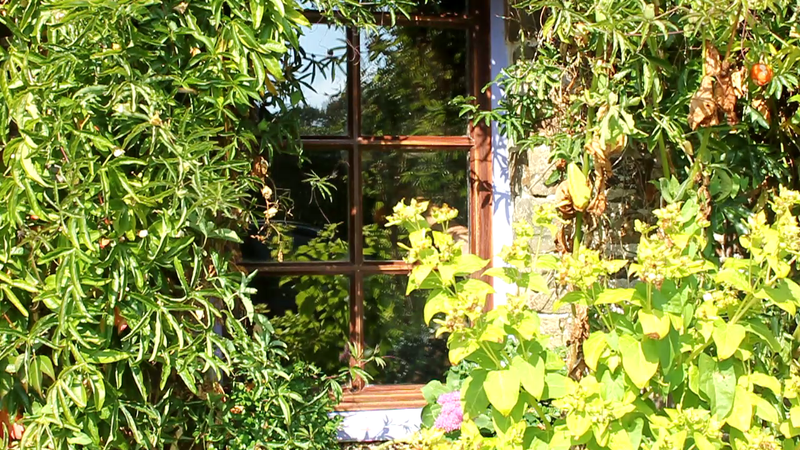 In this post I am going to start with the first of my three window projects for this Autumn, the easiest one, replacing an existent recuperated window (above left). We luckily recuperated a pair of these double-glazed units some ten years ago and I made a frame for and fitted one of them into our sitting room. 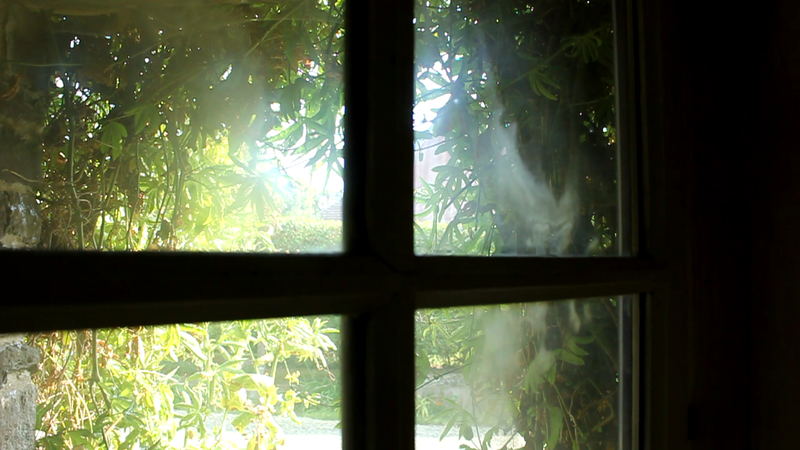 In the past few months this window has began to look foggy or 'sick' as the seal between the two layers of glass had started to deteriorate. All double-glazed windows have a frame with an elaborate profile to ensure a watertight, draught proof joint. The frame for the window was made using softwood (pine) and if I remember correctly was cut from floor joist wood left over from when we put floors in this part of the house. The wood selected was as thick as the window. 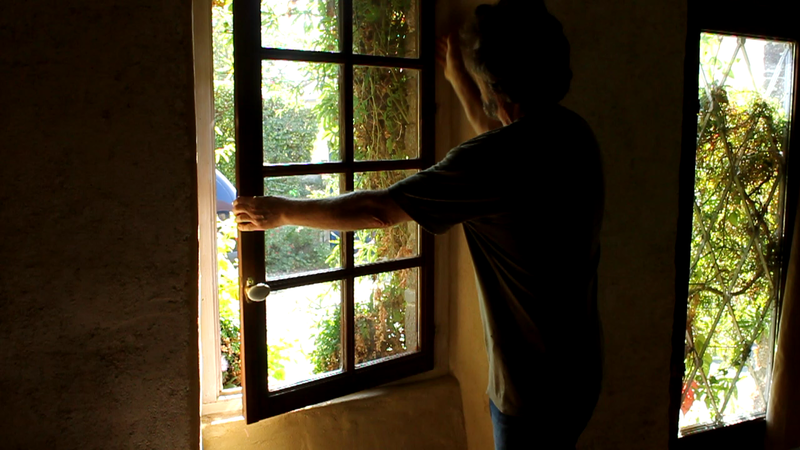 On completion the outside face of the window rested against a rebate cut into the frame. 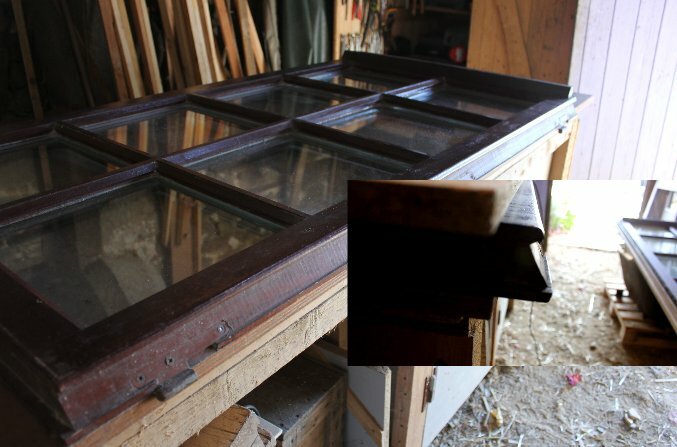 The interior face of the window had a 'lip' 10mm thick on 3 edges (top, bottom and latch) which butted against the frame. The lip extended 10mm from the window edge thus, the interior height of the window was 20mm more than the exterior height. 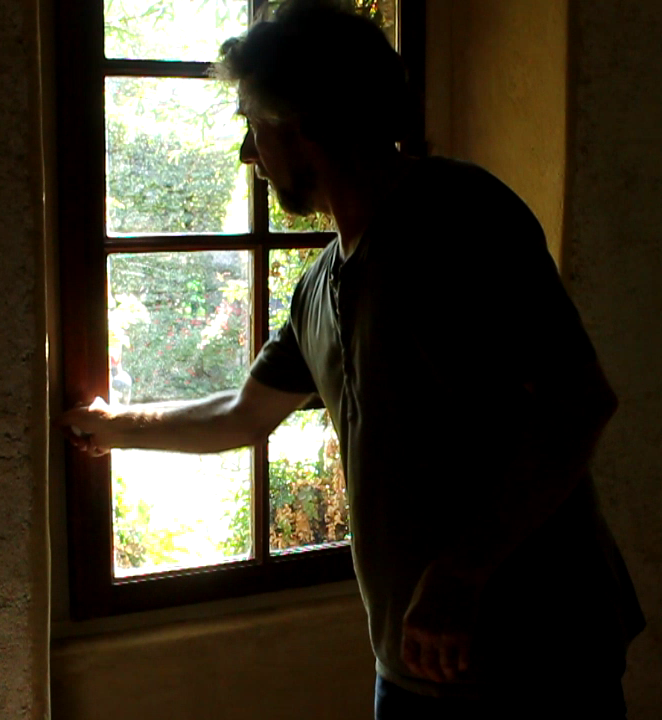 The fourth (hinge) edge of the window was not originally cut square but was cut at an angle (inset above). 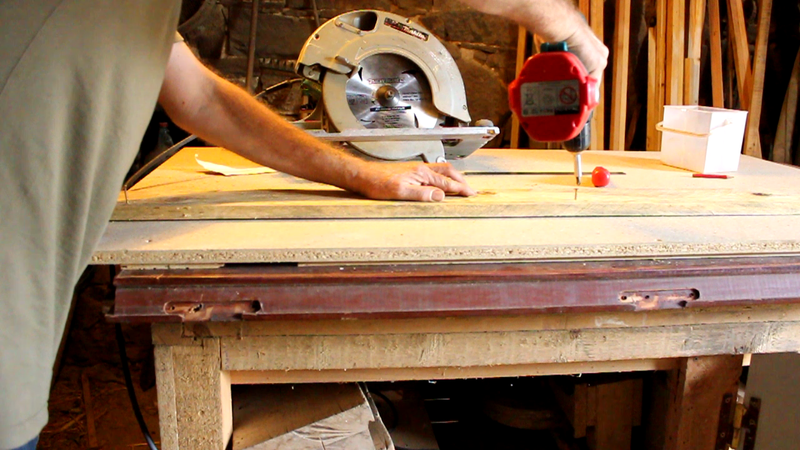 I could not hope to achieve this when making the frame, so, after removing the hinges, I cut out the angle and made this edge the same as the top and bottom and made the frame to match. The profile on the latch side of the window (the one opposite the hinges) was slightly more elaborate in that it had a stepped profile to accommodate the latch mechanism and a rubber seal running the full window height. This meant that in forming this part of the frame I had to make two additional cuts with the circular saw to produce the matching profile. Throughout the the life of this window I have never detected any draught so consider the fit was more than adequate. Thus with the replacement, after the overall dimensions were found to match the old unit, the hinges were removed. 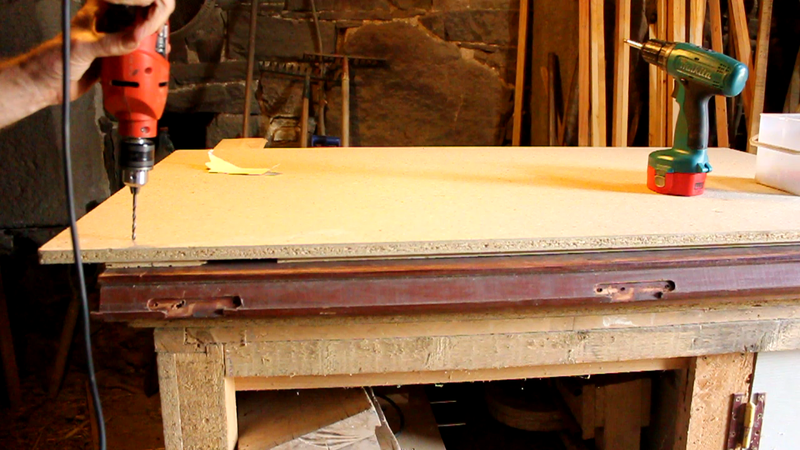 In the following photographs you can see the steps I took to cut the edge square using a circular saw. The desired cut was 10mm less than the full depth of the wood so as to ultimately furnish a lip that would match those on the other three sides of the window. 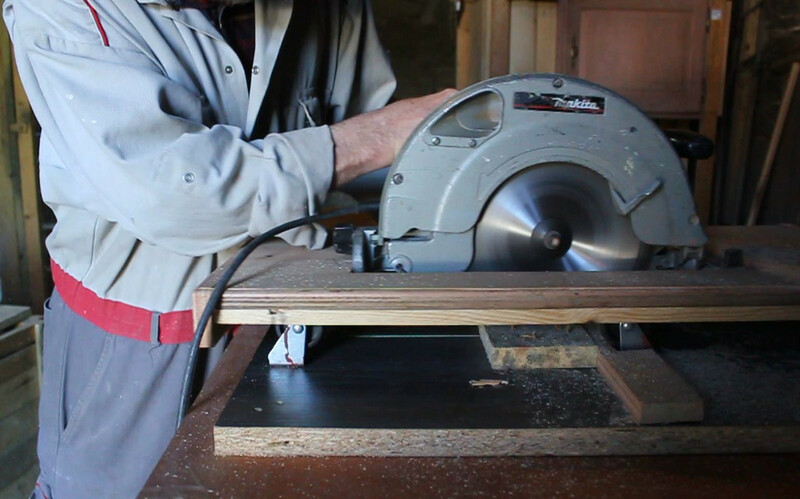 In my workshop I do not have a saw table but I do have an excellent circular saw. So, whenever possible, I do not use the guide on the saw but use a clamped straight edge against which the baseplate of the saw can slide. In the case of the window I also lacked a surface upon which the saw could move. So, to furnish this I screwed a flat piece of chipboard (recuperated from a pallet top) to the uppermost (inside) face of the window. 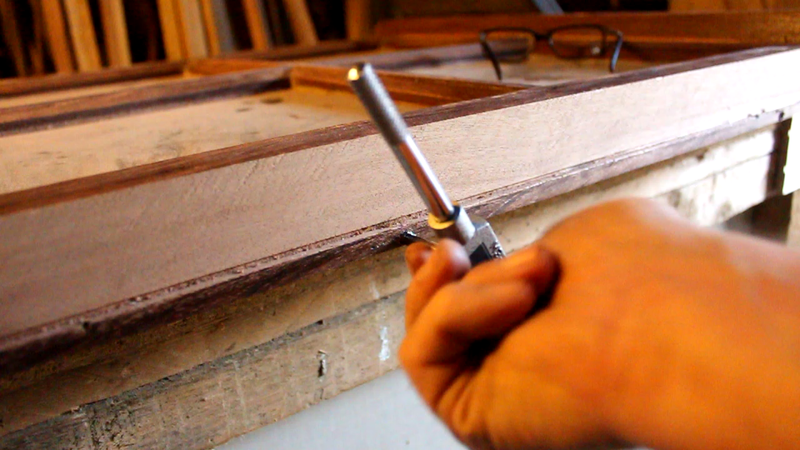 It is to this surface that I screwed the straight edge to act as the saw guide (below). 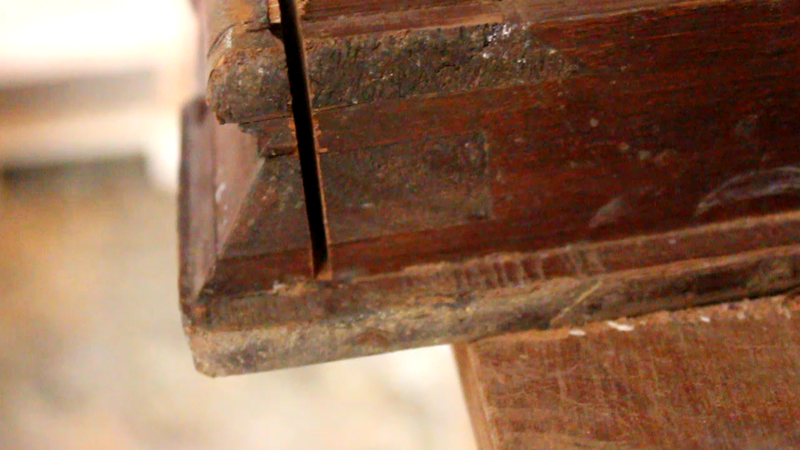 The second and equally important point about using the chipboard is that prudent packing beneath it brought its upper-face level with the stool (the projecting profile that sheds rain water onto the sill) so that the depth of the saw cut remained constant. You can see the packing in the picture above and below (I used 10mm thick pieces of cladding wood). When I unscrewed the hinges I had two screws that sheared off in the frame, these I then had to drill out so as not to damage the circular saw blade, maybe I should have put a few drops of release oil on the screws prior to trying to get them out. 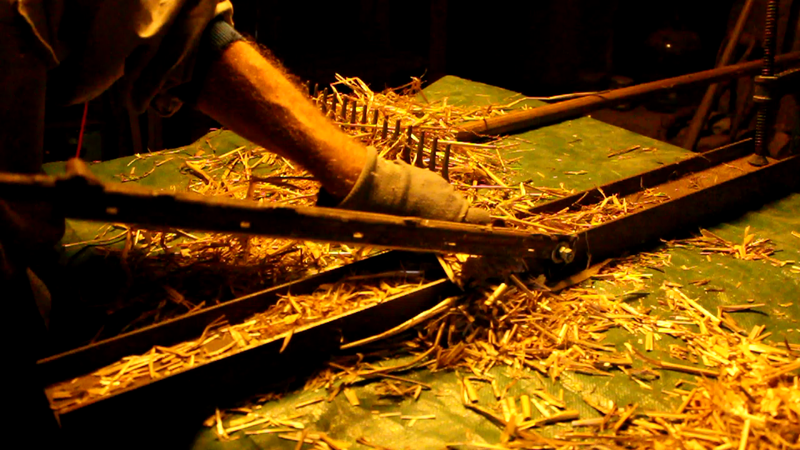 It is crucial to set the saw depth to produce the lip the same as on the other sides. 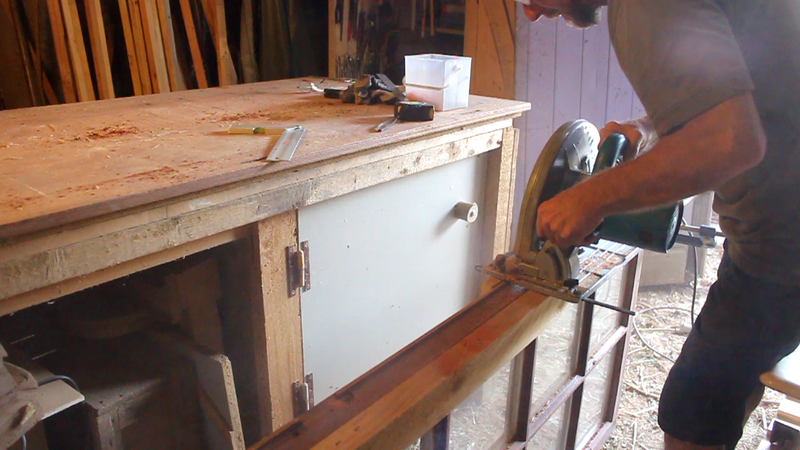 In making the second cut to produce the lip, the guide and chipboard were unscrewed and the window placed on the floor, held vertically by clamping one end between the jaws of a 'Workmate'. 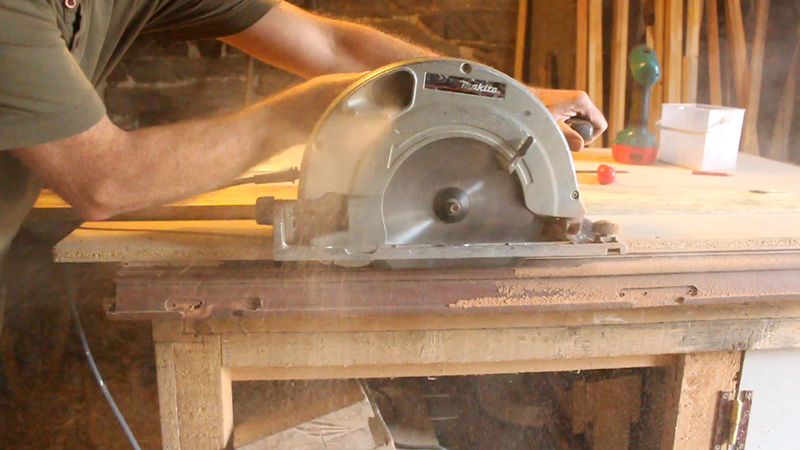 I clamped a flat piece of timber along the window edge to provide additional support for the saw so as to help maintain the 90º cut along the length. The depth of the cut was set so as to intersect the bottom of the first cut. Once the cut had been made I was left with the desired square cut edge except that the lip produced was slightly too long, This lip length was important as this is the where the hinges are mounted. Laying the window back onto the workbench I screwed the straight edge to the uppermost face so as to guide the saw in its third and final cut. The existing window was hung on screw-in barrel type hinges and as they were in a perfect condition, I intended to use them again. I obviously had not removed the one half of the hinges from the window-frame so I needed to remove the other half from the old window and screw them into pre-drilled holes in the replacement. 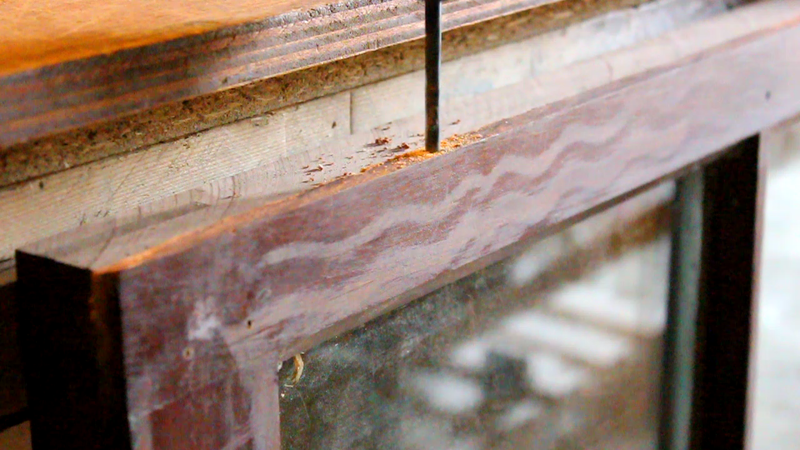 To ensure the holes were drilled vertically into the edge (of the lip), I rested the window on a pallet which was made to be parallel to the workbench top, the window resting against the leg of the workbench. I used a try-square to check that the window was at right angles to the workbench top and used wood packing between the window and leg to achieve this. Once all was checked OK for being square I drilled pilot holes at the pre-marked positions using the small drill press on the top of the workbench, thus ensuring the hole was square going into the 10mm thick lip of the window. I next opened up the holes by drilling once again but with a larger bit, the pilot holes ensuring the bit did not ‘wander’. 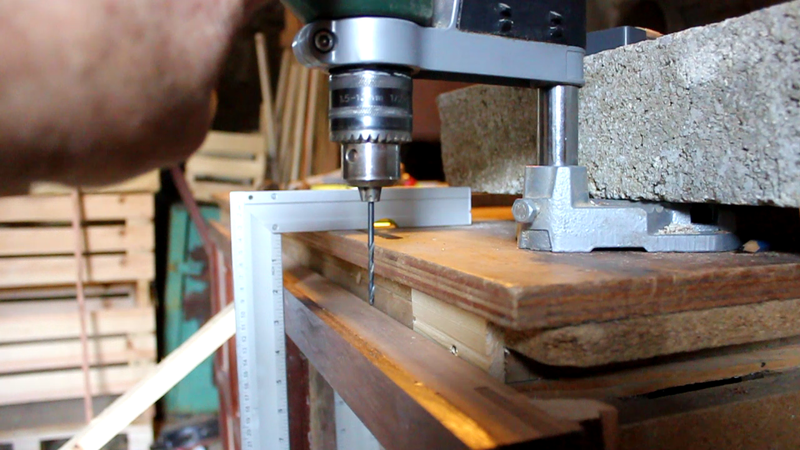 When I had finished drilling, I tried the window in place to ensure the fit was good. Once done, I could remove it and insert the hinges. The hinges had an M6 thread and I have found with exotic hard woods that by running the matching tap into the holes it makes it much easier to screw the hinges in. What was then required was to lift the new window onto the hinge counterparts in the window frame, again some adjustment was necessary to ensure exact alignment with each hinge. This can be the most time-consuming part of the operation as it may require the screwing in or out of each hinge until the precise alignment is obtained. When the window was satisfactorily mounted. I could check that it still fitted in the frame, some slight sanding was required and that the closing mechanism also engaged with the existing holes in the frame. Et Voilà! - a new window! Thanks for dropping by and please feel free to share this article, comment, ask questions and if you'd like to be assured of getting the next post, then sign up to follow this blog. For some time we have been toying with the idea of changing the heating system in our sitting room and even considered starting over from scratch and making a rocket mass heater. However, we actually have a fully functioning and useful Godin in there, which it would be a shame to part with. To this end we have decided that it would be quicker and more economical to actually work with what we already have and build what is known as a 'night storage heater'. thermal wall or heat sink at the back of our stove. Our house is heated entirely by wood-fired appliances: in our kitchen we have a clean-burn wood-burning cooker which by convection heats the rooms above. The walls, as you can see we insulated, in the kitchen with chopped straw and lime and then on top a layer of hemp and lime. Paradoxically, if we had left the space behind the cooker and the Godin bare we would have had a natural heat sink ready made. However, this is a 300 year old vernacular farm house and the bare walls, unlike the section over the fireplace were not particularly decorative and were never meant to be exposed to view. In the past they would have been whitewashed with lime, probably on a yearly basis. The cooker is set partly into a huge granite fireplace which itself acts as a heat sink, thus providing the room with some heat even when the cooker isn’t lit. Thus, I have been thinking how I could create something similar in the sitting room. that I need to focus my attention before the arrival of Winter. 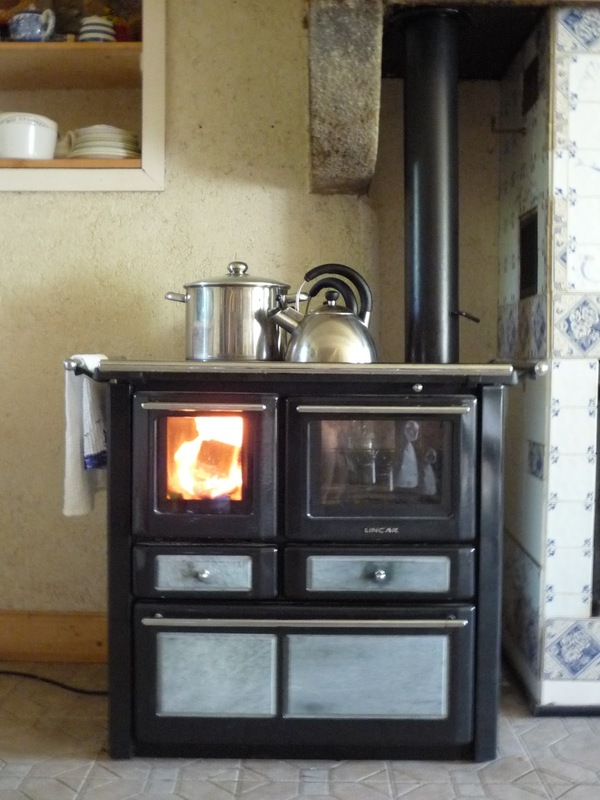 The stove works really well, even though it is primarily set to burn coal and even in the coldest periods will rapidly heat the room. The only real problem with it is the room gets too hot resulting in us letting it burn itself out and then having to relight it as the temperature drops. 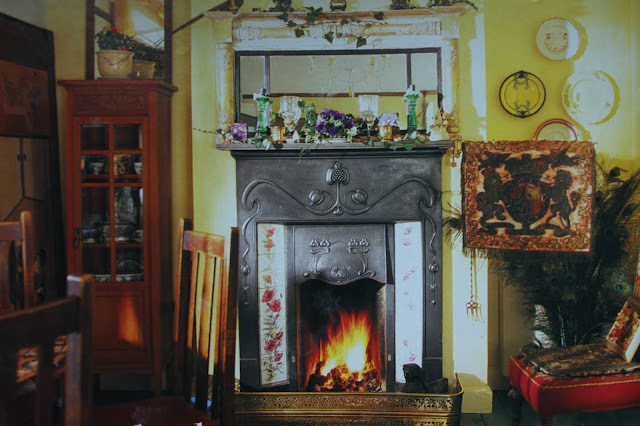 What I want to do is store some of the heat emitted by the stove and to let it transfer its stored heat as the room temperature falls – exactly as a night storage radiator works. The stove stands on a tiled plinth, the plinth is laid on a foundation on the ground beneath the suspended wooden floor. To avoid removing the tiles I chose to build the wall on a strawcrete pad , this to furnish a ‘softer’ interface between the tiles and the walls and to ensure minimum heat loss from the wall by conduction into the plinth. I had initially thought of building the wall in an adjoining stable and transporting it, still in its’ shuttering, into the lounge. I rejected this idea when I realised that the completed wall would weigh in the region of 180-200 kg. The 'soft' lime mortar to be used between the stones will withstand the elevated temperatures. 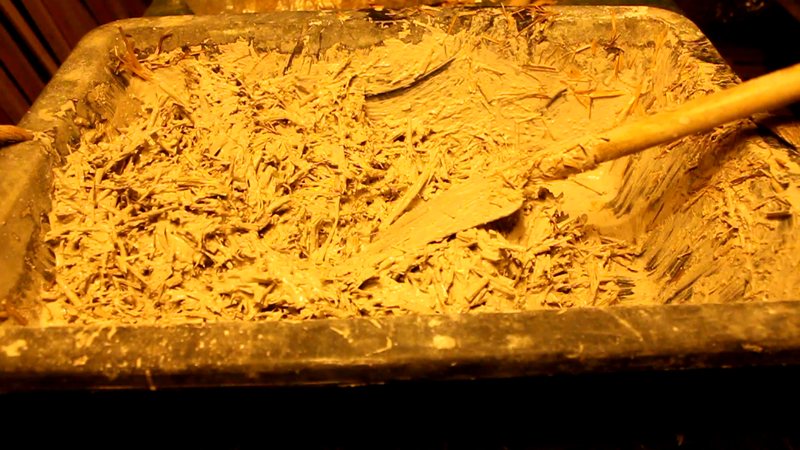 Strawcrete: made from chopped straw mixed with a lime mortar. 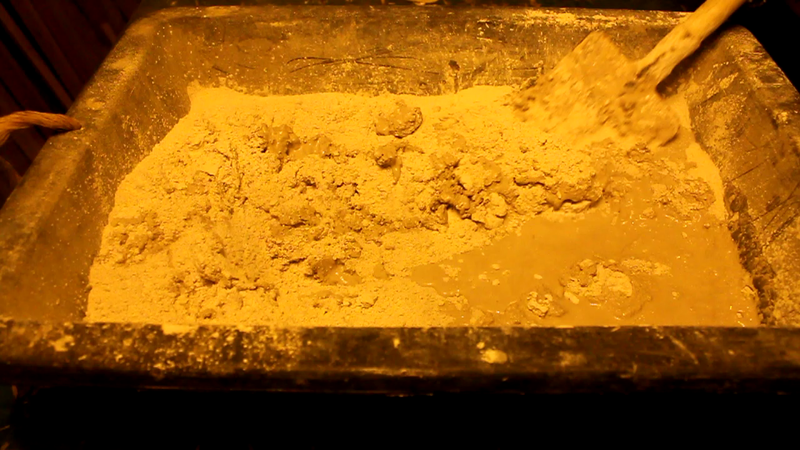 I had used strawcrete before as an insulation material on the interior walls of our kitchen. One of our outbuildings had a loft full of straw, this I chopped using a modified lawnmower. The strawcrete made from this material made a significant difference to the warmth of the kitchen and the following summer we plastered the entire kitchen walls with hempcrete on top of the straw. Stone: The stones used are those which have already been used in the walls of the house and have been removed in the construction of doorways and windows. Safety gear: Although hydrated lime is much less aggressive than aerated, it will sting if you get it on your skin or worse still, in your eyes. You should therefore provide yourself with a pair of thick rubber gloves and a pair of eye goggles. It is also a good idea to keep a bottle of clean water on hand just in case of any slip ups, so as to wash off any splashes of lime. When working with natural building materials one of the first things you notice is that they are not uniform. This was something we were very much aware of when insulating our house walls and floors with linen, hemp and straw, on no day were either the mix quantities nor the elasticity of the mortars the same. They were dependent on humidity levels in the air, ambient temperatures out and inside and the different batches of the raw materials. There is obviously certain quantities one can work to but be aware that you need to get a feel for these materials as you go along and that, in particular the quantities of water used will not always be the same. However, take your time, work slowly and enjoy being in tune with the organic qualities of natural building. The first stage was to make the strawcrete pad. 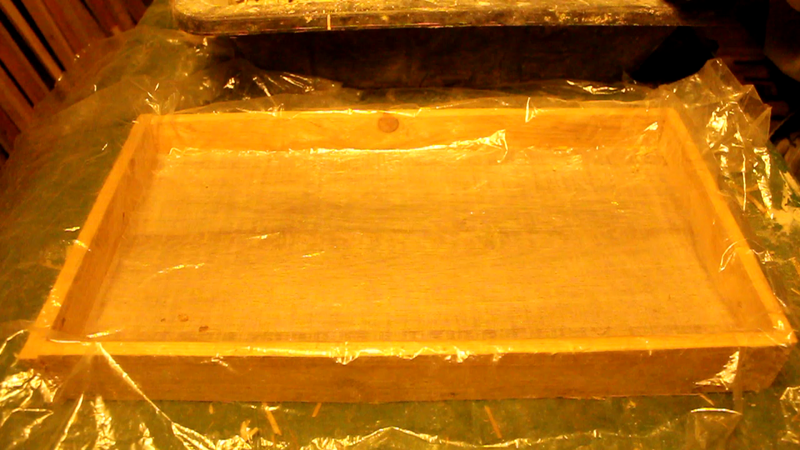 I constructed a wooden mould to the required size and lined it with a thin polythene sheet. Next I mixed a mortar of lime and water. I kept slowly adding water to the lime until the mix had the consistency of a batter, you will see this more clearly in the film. 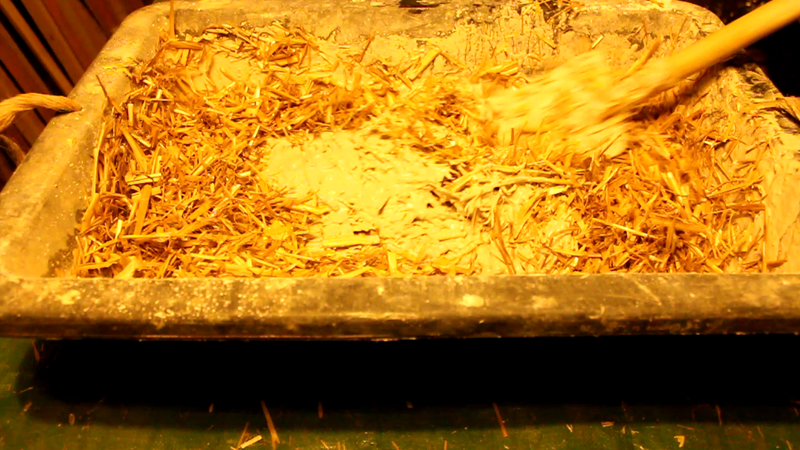 Once this was mixed to a smooth consistency, I added the chopped straw. As with the water, I added the straw little by little, mixing it into the liquid with each addition. I was seeking the stage where there was no longer any liquid lime left in the mixing receptacle and all the pieces of straw were coated with the lime mortar. 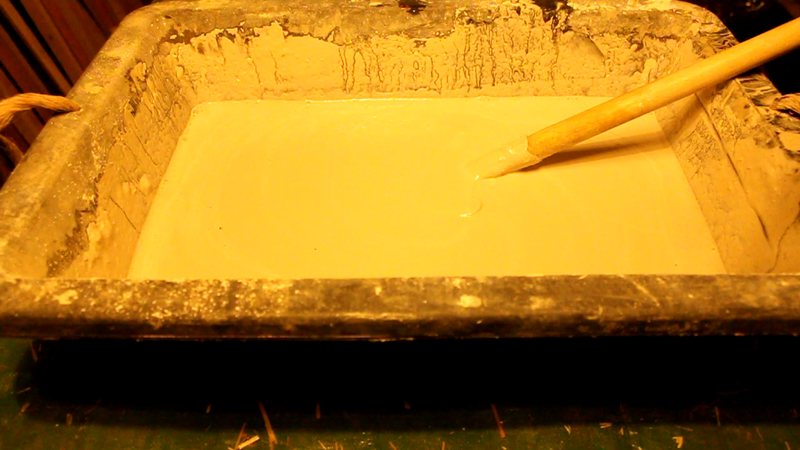 The mix could then be transferred into the mould, ensuring that strawcrete was tamped into the corners and along the bottom edges of the mould. 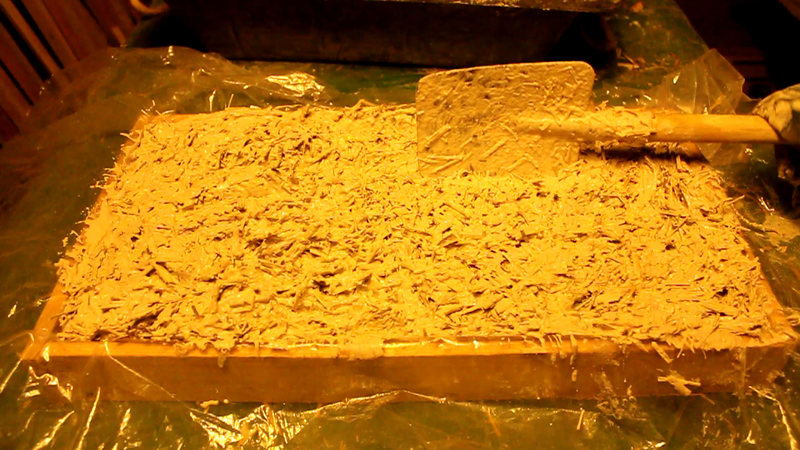 In between the addition of strawcrete the mix in the mould was tamped down using a wooden block. 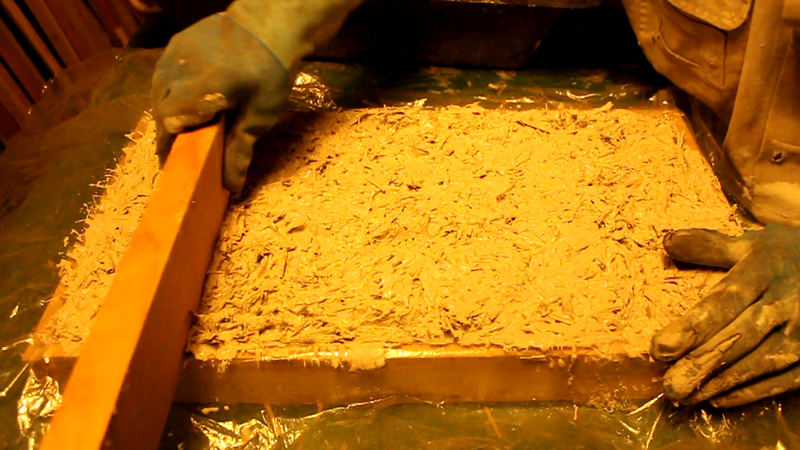 Once full the excess strawcrete was scraped off using a straight piece of wood and the pad was left to dry. Thus stage one of the storage heater is completed, the rest will be built in situ, follow this link for: Part 2 Building the Wall Now if you'd like to, sit back and watch the film. 20+ years experience in Industry and Academia. Now a happy peasant living by the sea! The Green Lever is a participant in the Amazon Services LLC Associates Program, an affiliate advertising program designed to provide a means for us to earn fees by linking to Amazon.com and affiliated sites. 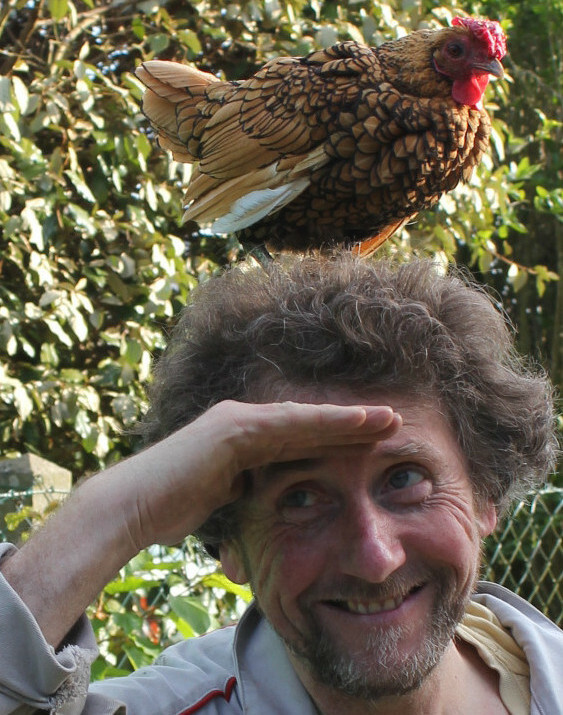 LATEST ARTICLE - Co-parenting is on the rise in the forest garden. Latest Article: Rose Hip Syrup - Cheers and Brings Health! Home-made low cost pallet wood greenhouse, viable, safe, year-round food production. 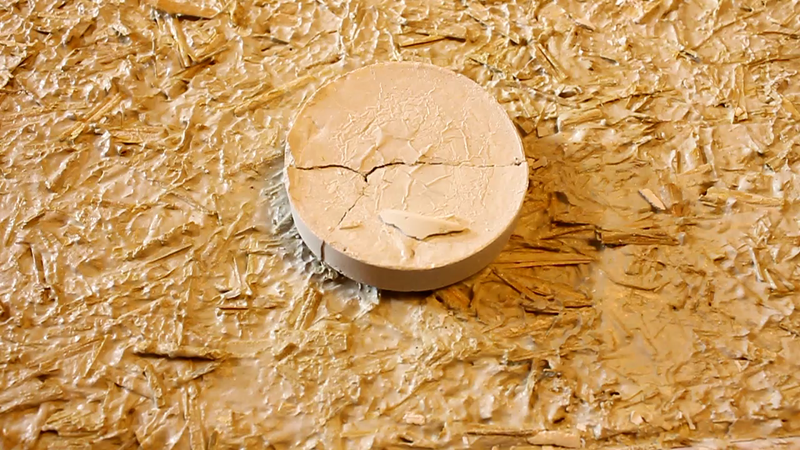 Mixing and using lime mortar and why it's a great idea to take a natural building diploma!